Australia has let down our vulnerable foster children. They’re being abused in a time when they need care and support. We need to make a change and take a stand for those who are voiceless. This Ebook covers the history of foster care in Australia, the stats on our young people in foster care, and two horrific stories of children who were let down by our inefficient system. 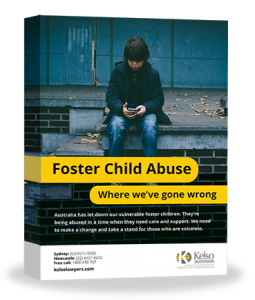 Download this Ebook today and learn more about foster care abuse. We need to break the cycle of children entering the system, and being let down by our government. Have you been abused while in the care of a state-appointed foster parent? Download our guide to compensation today and learn how Kelso Lawyers can help you.